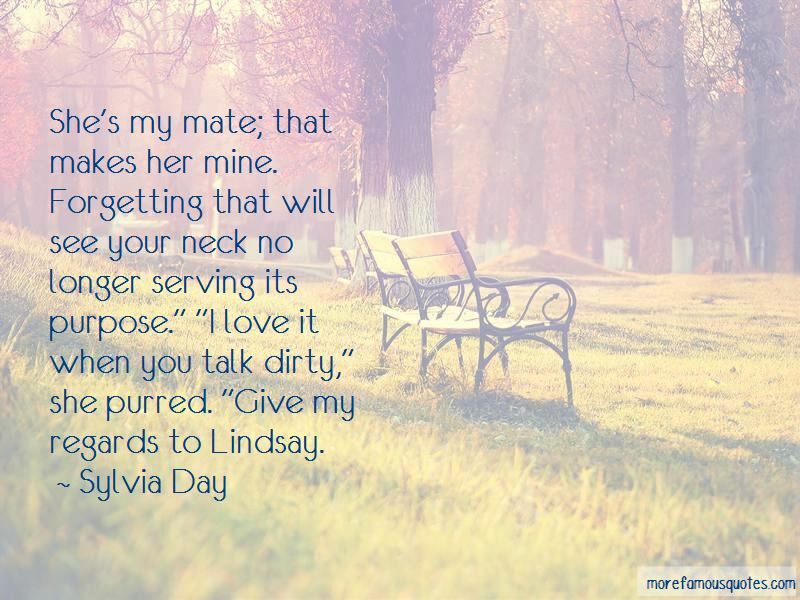 Enjoy the top 428 famous quotes, sayings and quotations by Sylvia Day. "You just see this"-he gestured at himself with a wave of his hand. "You're not seeing the fucked-up, broken mess inside." “I flipped the good doctor the bird. Snorting, Gideon caught my hand and pulled me back down the hall. "What is it with you and giving people the finger?" He could shred me so easily. A few words, a desperate look, and I was cut wide open. I'm still not sure I didn't hallucinate the conversation while overdosing on his pheromones. “Cary rocked back on his heels and twirled one index finger around another in a sign meaning, wrapped around your finger. Can I take advantage of you in the limo?" His eyes laughed at me. "By all means, angel mine. More like Cross blew your circuits during one of his sexathons. Still can't get over that man's stamina. Wish he'd swing my way and wear me out. I stared at him over the rim of my mug and didn't say anything. Gideon shoved his shirttails into his slacks with obvious frustration. "Fine." "You could refrain from grinning like the Cheshire cat," he muttered. He's a Sentinel. An angel created to hunt and punish other angels. He was designed and built to feel no emotion, to function almost like a machine. One mission, one purpose, no deviations. But he's deviated a lot over the years. Now more so than ever before. And he's paid the price. He's paying it even now. I've got a call on hold to send your way," she said. "And I hope it's personal, because holy hell is his voice smokin' hot. He sounds like S-E-X rolled in chocolate and covered in whipped cream." Nervous excitement raised the hairs on my nape. "Did he give his name?" Golden girl, there you are. I'm singing for the crowd, the music's loud. I'm living my dream, riding the high, But I see you there, sunlight in your hair, And I'm ready to go, desperate to fly. Golden girl, there you are. Dancing for the crowd, the music's loud. I want you so bad. I can't look away. Later, you'll drop to your knees. You'll beg me please. And then you'll go, it's only your body I know. Golden girl, where'd you go? You're not there, with sunlight in your hair. I could have you in the bar or the back of my car, But never your heart. I'm falling apart. I'll drop to my knees, I'll beg you. Please. Please don't go. There's so much more I want to know. Eva, please. I'm on my knees. Golden girl, where'd you go? I'm singing for the crowd, the music's loud. And you're not there, with sunlight in your hair. Eva, please. I'm on my knees. I was unsettled at the thought of going the entire weekend without him. Worse, I hated the thought of him spending that amount of time away from me. He had a world of choices and possibilities out there, women who weren't so screwed up and difficult to be with. My problem was me, and I didn't want to concern him with something he couldn't change. Only I could make myself a stronger person, and I needed to, if I wanted to make him happy and offer him the security he so desperately wanted from me. “Gia." Jax caught my upper arm as I moved to pass him. "I've got this. Don't stress." "Easy for you to say." I told him, my chin lifting. "You don't have anything on the line." I already have the cake. 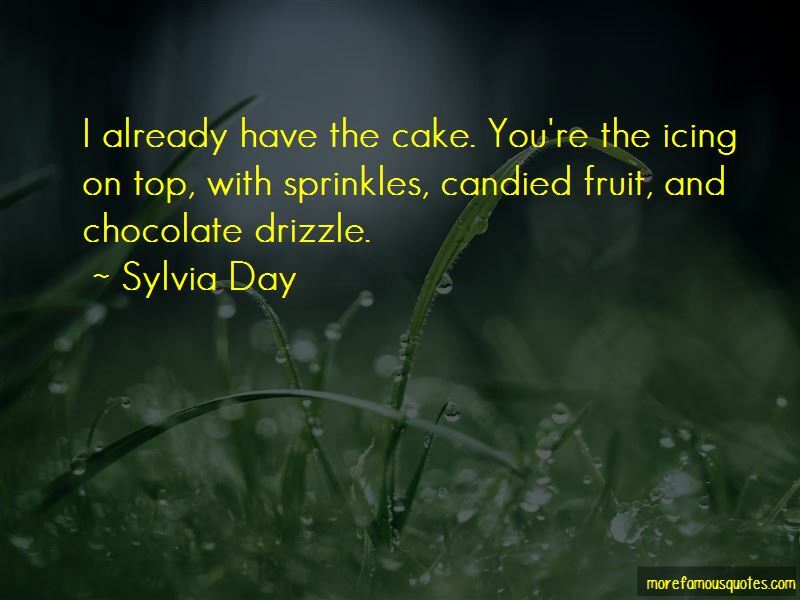 You're the icing on top, with sprinkles, candied fruit, and chocolate drizzle. 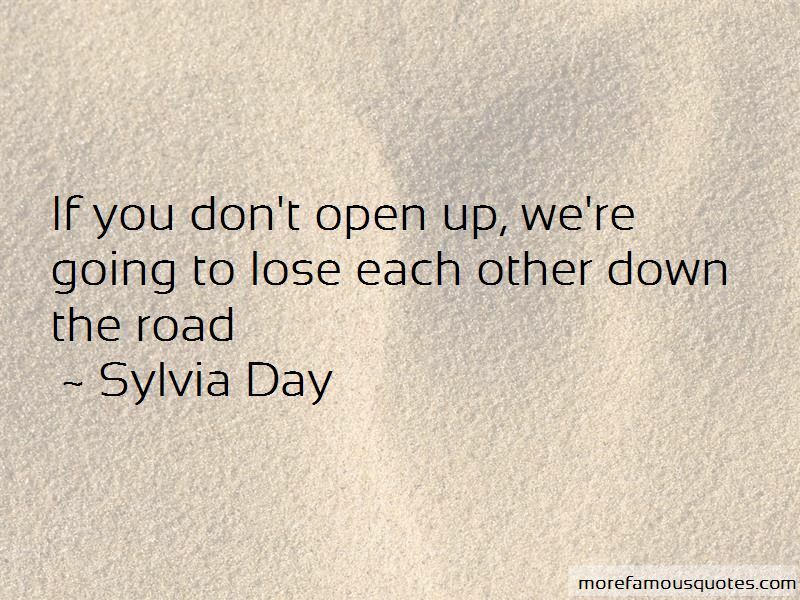 Want to see more pictures of Sylvia Day quotes? 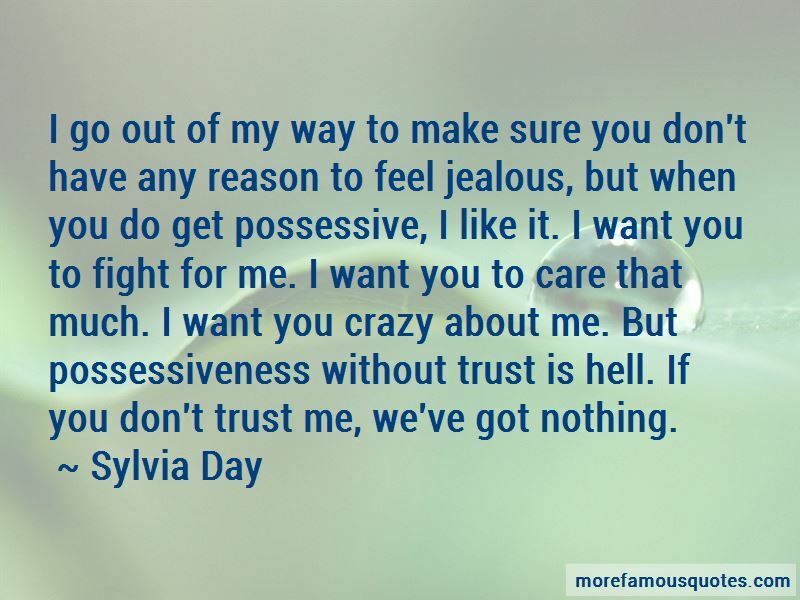 Click on image of Sylvia Day quotes to view full size.